Visit our BLOG for more info about Halloweekends 2018! Pick one weekend or REPEAT the Fun! Download your FREE 8 x 10 photo frame! Save image to your computer to print out on cover stock. 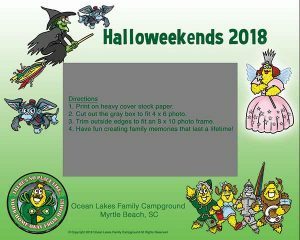 Masks and face coverings are only permitted to be worn in Ocean Lakes for the 3 Halloweekends*** (on Fridays and Saturdays). 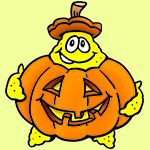 They cannot be worn in our businesses (Sandy Mart, RV Center, Golf Cars, Main Office, Ocean Lakes Properties, Sandy Harbor) except during Trick o’ Treating on Saturdays from 4:30 – 6:30 PM. Also, they are generally permitted in the Recreation Center as it is the hub of our Halloweekend events and costume contests. Operating a vehicle or golf car with a mask or face covering is NOT permitted as it is a safety issue and also hinders Security in identifying underage drivers. Security teammates will use discretion on a case by case basis as needed throughout Halloweekends regarding masks, coverings, costumes and decorations. Please remember all the “young eyes” in our campground and be family friendly!